Bangor's Zach Ireland (left) throws to first base in this 2017 file photo to try for a double play. BANGOR, Maine — Zach Ireland stepped into what many high school baseball players would consider an unenviable position last spring. 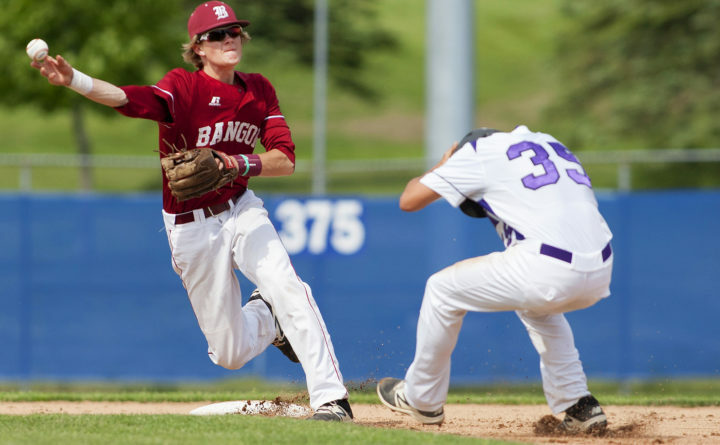 Not only was he replacing a four-year starter at shortstop for Bangor High School, but in Kyle Stevenson he was taking over for someone who had helped the Rams win three consecutive Class A state championships. But thanks in part to a conversation between shortstops past and present, that transition has proven to be remarkably smooth and the winning has continued. Bangor already has extended its state championship streak to four and will try to win a fifth straight regional title at 5 p.m. Tuesday, when the top-ranked Rams face No. 2 Oxford Hills of South Paris at Morton Field in Augusta. “Obviously stepping in for a four-year starter at shortstop there was some pressure,” Ireland said, “but we had a good conversation about it and honestly, just like he told me, it’s all about confidence. Ireland has been a defensive anchor, helping his high school team win it all last spring and then being a major contributor as Bangor’s Coffee News Comrades captured their third American Legion state championship in the last four seasons. This year, the senior has committed only nine errors in 18 games for the 17-1 Rams while batting .311 with 17 runs scored, 12 RBIs and a team-leading seven doubles from the second spot in the batting order. “He’s been killing it over there at shortstop. And not only has he been doing it on defense, he’s been killing it on offense, too. And he’s also been a demon on the basepaths,” Bangor senior catcher Tyler Parke said. After playing shortstop while working his way up the youth baseball ranks, Ireland got the first crack at the varsity job in 2017. Ireland has continued this spring to focus on his primary job, middle-infield defense with senior second baseman and good friend Zach Murray. “It’s really hard when you sit back and you let the ball play you, but coming through the ball hard and taking the right angle is something I’ve really been working on,” he said. Ireland’s offense also may be peaking for the right time as Bangor continues its quest to become the first Maine high school baseball program regardless of class to win five consecutive state championships. In Bangor’s 14-6 semifinal victory over No. 4 Lewiston on Saturday, Ireland went 4-for-4 with a triple, double, two singles, two runs scored and four RBIs. His three-run triple in the fifth capped off a seven-run rally that transformed a 4-2 deficit into a 9-4 lead. “I’d say the biggest thing right now as he approaches that next chapter in his life is that confidence and those leadership skills he has and how he affects the others around him,” Morris said. Ireland’s breakout offensive game against Lewiston on graduation eve came barely 48 hours after he determined his collegiate future after meeting with University of Southern Maine baseball coach Ed Flaherty. “We had a good talk for a while, and I think that’s going to be my decision,” he said of USM. Morris sees Ireland making the transition to college baseball as smoothly as he adapted to the high school pressure cooker of replacing a four-year starter on a championship team. “Zach has made his own mark. He’s his own player, and I think he’s going to be a really good college player,” Morris said. But while Ireland’s collegiate path may be cleared, high school history beckons. “Five in a row would be impressive,” he said, “but we’re just going to take one game at a time, one pitch and one out at a time, like we always do.